Description: Now preserved N&W 4-6-2 built by Richmond in 1910. Description: Submission #600. Date approximate, but its way back when I had more hair, and less waist. This engine was in tough shape when this photo was taken--I hate to think what kind of condition it's in now. 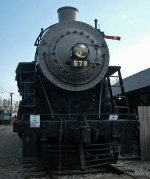 I can remember a time back in the early 1960's when they would still fire up #578. I don't think she's had a fire in her belly for a long, long time. Description: One of my oldest (and most treasured) railfanning photos, back when #1 was on ORM property. 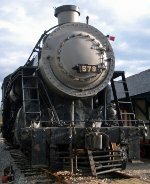 N&W #578's tender was being repainted at the time. Description: The sun gleams down upon 578 during a chilly October afternoon. 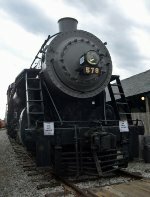 Description: At just past 101 years old in this photo, I think 578 looks rather well for her age. 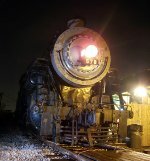 Description: The very last Norfolk & Western Pacific in existance. Description: As the operations of another Sunday at ORM come to a close, it's time to get some last shots of an 'all dressed up' 578. Description: Still looking good after all these years. Description: 450 sits with 578 and 7 as she awaits her trolley poles to be changed for the next departure. Description: A shot taken from a Motorolla cell phone camera during the ORM's first Trick & Treat Express event. 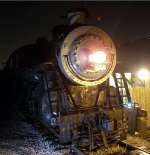 Description: A cool evening at the ORM starts a small volunteer photo shoot with 578. Description: With light assistance from 7178 further back in the yard. 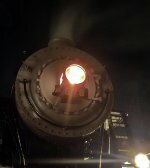 Description: Close up of the N&W Queen. Description: All that's missing are her marker lights - and yes, I'm aware of the extension cord. Description: For such a small and impromptu shoot, I think we did rather well with what we had. Description: And with a final shot, that's a wrap for Halloween at the ORM. 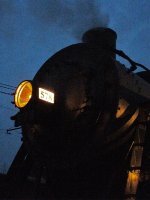 Description: The world's very last Norfolk & Western Pacific type at twilight. 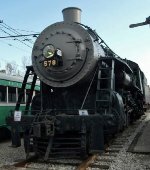 Description: A normal yard scene at the Ohio Railway Museum. Description: 578 sits in the fading sun as possible storm clouds approach from the south. Description: A (hopefully) unique shot, 578 and a semaphore with a half moon in the far distance. Description: Preparing for another night (and another year) of Trick & Treat Express, 578 is all ready to go. Description: One of the reasons why October is my favorite month. Description: While I absolutely loathe how grainy this shot is, I love it all the same. Description: The Queen of the Norfolk & Western. Description: On the very day of 578's 103rd birthday, her and 2 sit in the ORM yard during a light snow. 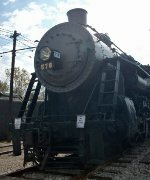 Description: 578 sits in the sun as a few ORM volunteers prepare for a tour. 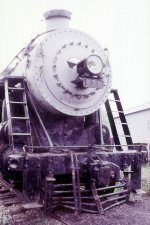 Description: Side view of the world's last N&W Pacific.